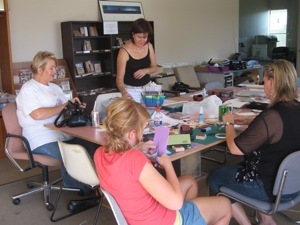 The card drive for victims and volunteers involved in the Victorian Bush Fires gained momentum on Sunday 8th of March when Linda Lucas and I co-hosted a community day for card making. Linda has been co-ordinating the collection of cards from friendly card makers around the world, all of whom have been saddened by the events of the Victorian Bush Fire, and Sunday was to be the chance for Canberrans to add to the pile. In all about 60 cards were made on the day - I only got one finished as I seemed to be running around all day, checking that morning tea, lunch and afternoon tea were all there when the workers needed a calorie boost! I should mention here that buns for morning and afternoon tea were kindly donated by Baker's Delight at Lanyon, so if you're reading this page and you live in Tuggeranong, pay them a visit - they are great bakers! Thanks so much Stampin' Up! - you really are a company with a heart. 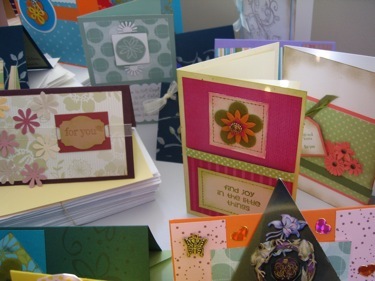 These are some of the 386 cards completed for the Victorian Bush Fire card drive so far. It was wonderful to see so many different styles emerge from the participants. It amazes me how some ladies can chat and work at the same time - well done ladies. We had a few young people join us as well and they contributed with some very creative cards. I love seeing young people develop an interest in craft, and it was touching to see how interested and caring they were in the thought that went into the cards they made. 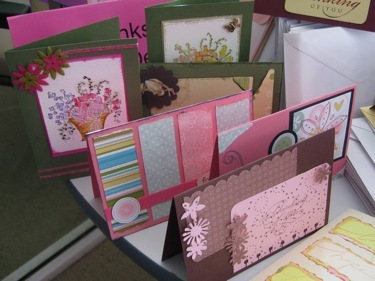 Most of the equipment used for the day was from my supplies of Stampin Up goods. I do admit to bringing out some old ribbons, stickers and other embellishments from pre SU days, and I'm thrilled that these supplies went to such a good cause. I'm looking forward to them going, so I'll have an excuse to buy more of the fabulous quality Stampin Up products that are my absolute favourite. 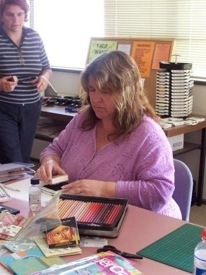 One of my down-lines, who is an absolute gem, (Hi Chantal) had undertaken to get some cards made with a group of her friends because she could not come to the Sunday function in aid of the Victorian Bush Fire. She thought about 40 would be the total but she has just emailed me with the news that one lady alone made about 60 cards and her groups total contribution will be 100. 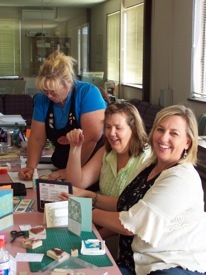 I'm thrilled, but somehow not surprised at the generosity of these ladies, as the more involved I become with stampers and card makers, I realize what a caring and giving group of people they are. Sincere thanks to everyone who participated in this venture. 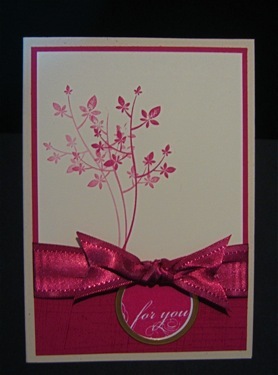 We hope our gesture will add a little brightness to the day of the recipients when the get out cards. Oops! almost forgot that Waste Away - my husband's business kindly provided the venue and the sausage sizzle for lunch - the boss even did the cooking! 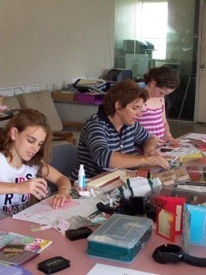 We had a wonderful day of friendship, creativity and card making for the Victorian Bush Fire victims. and of course we mustn't forget the volunteers who risked so much to help others. Here are a few pictures of us "working". And here is a shot of the 386 cards we had at the end of the day. I expect from the response we will have approximately 600 by the end of the week, and then they will be handed over to the Salvation Army to distribute when they deem it to be appropriate. Friday 13th March. I just wanted to add a few more photos of cards that I've received from a friend and a couple more that I've made this week. Our total continues to grow, and that is very exciting. These cute cards are from my friend Lorraine. 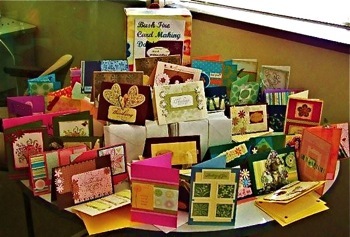 She wanted to make bright cards to add a little happiness for the recipients. This lovely set called Everything Mice is a retired set from Stampin" Up, and it has some really cute sayings and images. 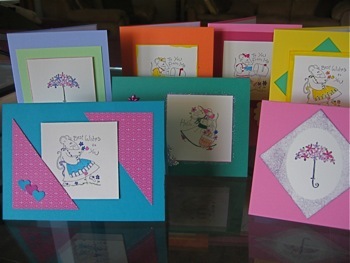 Thanks so much Lorraine for providing 10 gorgeous cards to this appeal. This card was inspired by leaves blowing in the wind. The images are from a Retired Stampin Up Jumbo Wheel, and I've coloured them with a Blender Pen and the soon to be retired "In Colour" - Groovy Guava. I've also used some background stamps Canvas and Sanded, to create the illusion of texture on flat card stock. 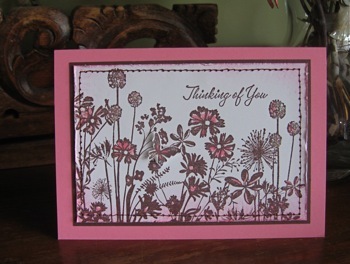 And for another card for the Victorian Bush Fire card appeal, I've used a silhouette stamp. This is one of the rare occasions that I've used a stamp from a company other than Stampin' Up. The image is printed in Chocolate Chip and selected parts are coloured with a Blender Pen and Pixie Pink ink. Hopefully those who have suffered in the fires will not have to wait too long before seeing some regeneration of the country side. If you look carefully you'll see a little butterfly added to each of the cards I've made for this appeal. There is always something hopeful about a butterfly. Can you see them in my cards? More cards added - March 16th. Here are a couple more cards that I've made this week. 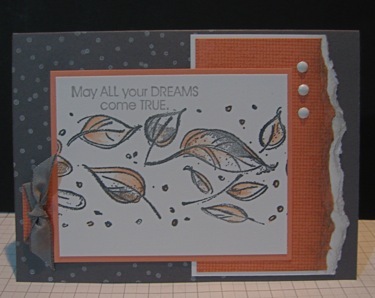 This is another card using the Jumbo Stampin Around Wheel. Just a few changes from the other card in the same grey and guava colour scheme - namely the positioning of the card elements, an addition of grey taffeta ribbon, and some white brads. 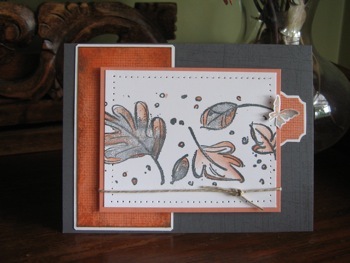 And finally - yes FINALLY, a simple card using the stampin' off method. This is such an effective technique to give you varied tones of the one colour. All you do is ink the stamp once, and repeat stamp the image a few times. The image gets lighter each time and gives you the illusion of depth in your card design. Add a little of the sumptuous, wide satin ribbon to cover the join of the Pomegranate (stamped with the Sanded Background Stamp and white card, and a greeting placed inside a metal edged tag and the card will be complete in no time at all. If you would like further information on any of the techniques used in the Victorian Bush Fire cards on this page, you are welcome to contact me and I'll do what I can to help.